The term SSL stands for Secure Socket Layer. It is a standard security protocol which is used for establishing the encrypted links between a browser and a web server in online communication. The purpose for the usage of SSL technology is to ensure that all the data which are transmitted between the browser and the web server remains encrypted. To brief about SonicWall, it is an American company that sell the network devices which provides services for the network firewalls, VPNs, UTMs, and anti-spam for email. Thus the installation of the SSL certificate is essential for maintaining the security standard over the network. Initially, a zip file with two files needs to be created. Then the .crt downloaded from the your SSL Provider should be taken along with the Account panel, and also the server key needs to be used that are generated during the CSR creation on the SSL-VPN appliance. – In the next step, the user requires to log in to the SonicWALL SSL-VPN appliance portal. – Then the user needs to expand the System menu and click on Certificates. – After that, it is necessary to install the CA certificates in order to make the website of the user compatible in browsers. – Then the user needs to click on the ‘Import CA Certificate’ option which is on the System menu, in the Certificate page in the Additional CA Certificates section. – Then the downloaded file from the SSL Provider Account Panel needs to be uploaded with the .ca bundle extension. – In the Server Certificates section, the user needs to click on ‘Import Certificate’. – On opening the Import Certificate window, the user needs to click on Browse, then locate and open the .zip file that has been created. – The user then should click on Upload for uploading the zip file. Once it is imported, the certificate would appear in the Server Certificates list on the Systems Menu, in the Certificate page. – Then finally the user needs to configure the SSL certificate. – In the Server Certificate section of the Certificates page within the System Menu, just right next to the SSL certificate of the user with the pending request, needs to click on the Configure icon. – In the next step of configuration, the user needs to specify the password created during the CSR code generation and then finally needs to click on the Submit button. – This is the time to implement the changes made. In the Certificates section of the System menu, the user needs to select the corresponding certificate and then in the top right corner of the page; the user should click on the ‘Apply’ button. 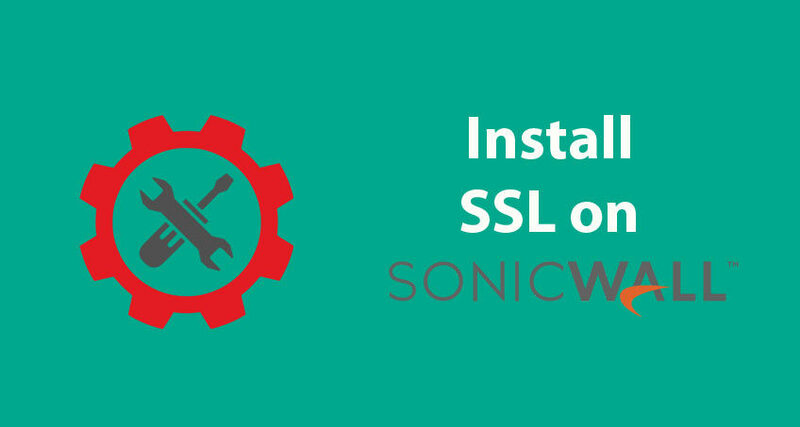 – Then the system would prompt the user to restart the SonicWALL SSL-VPN appliance. If not, then the user can restart it manually. – For restarting the SonicWALL appliance, the System menu should be expanded, and then the user should click on the ‘Restart’ button. Thus the SSL certificate has been successfully installed in the system. After the installation of the SSL certificate, the user can check the installation tool using several kinds of tools. Thus it can be seen that the procedure of the installation of the SSL Certificate is not very complicated for the user to perform. It provides the optimum path for using the SSL Certificate services on the network firewalls.